Bruthen is situated on the Tambo River, 24 km north-east of Bairnsdale and 300 km east of Melbourne. Bruthen, or Brewathan as the area was first called, is thought to be a word of Aboriginal origin meaning bracken or place of evil spirit. In the 1840s, the first pastoralists used the Tambo Valley as a route from the Monaro to the Gippsland plains. Matthew and Thomas Macalister took up the area as Kilmorie run in 1845. By 1858, a hotel, a store and a blacksmith near the Tambo River were catering to drovers using the stock routes and packers and miners travelling north to the mining settlements around Omeo. 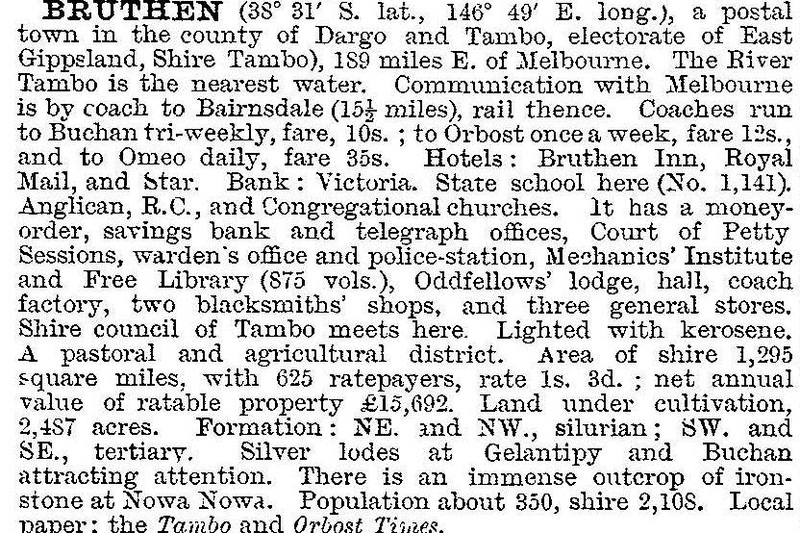 In 1859 a township was laid out, 2 km to the west, at the junction of the main routes. It was named Tambo as there was already a township named Bruthen between Sale and Port Albert. However, the old site at the river crossing remained the more population location. The lower Tambo River was navigable and in the 1860s steamers began to carry produce from Sale, Bairnsdale and Bruthen to Melbourne. A wharf was built at Mossiface, several kilometres downstream from Bruthen. In 1884 a wharf, known as Batten’s Landing, was built further downstream. It had fewer problems than Mossiface and it also became a busy port. The river had to be cleared of snags and dredged at the mouth to keep it open. A bridge was constructed over the Tambo at Bruthen in 1872. However, silting was a great problem and by the 1890s it was almost buried. To the west of Bruthen the Tambo township was beginning to develop. When a post office was opened in 1911, the township was renamed Wiseleigh in honour of the Federal parliamentarian for the area, G.H. Wise. The Bairnsdale to Orbost railway line passed through Bruthen. Regular services commenced in 1916. However the railway did not stimulate development as expected. During the Depression of the 1920s, the shire suffered a decline in population. During the 1930s the steamer traffic disappeared. Competition from road and rail traffic was great and silting of the river became an insurmountable problem. By 1935 the rail passenger services had ceased. Bruthen itself was not adversely affected. Its population rose from 530 in about 1920 to 580 in the late 1930s. The smaller townships, however, did lose amenities. The Bruthen area has extensive timber resources. In the 1940s two factories making handles for axes and tools were set up and there have been a number of sawmills over the years. In the 1960s and 1970s the mills were troubled by financial difficulties and distance to timber allotments. This affected the town unfavourably, with the population falling to 568 in 1976 and 449 by 1981. However the population increased again, reaching 850 in 1994, with retirees and commuters to Bairnsdale choosing the quieter rural lifestyle. 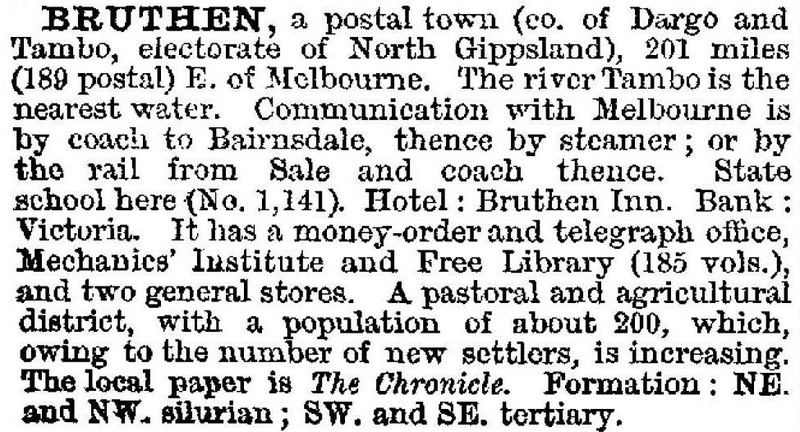 Bruthen has a general store, the former shire hall and offices, a hotel, a recreation reserve, Anglican and Catholic churches, a primary school (40 pupils, 2014), a police station and a caravan park. Its position on the Great Alpine Road has stimulated the opening of food outlets, a tourist information centre and a boutique Bullant Brewery. The former railway line has become a cycle trail, passing through Wiseleigh where houses have been refurbished.